Popular Human rights lawyer, Mr. Femi Falana (SAN) has told Governor Ayodele Fayose of Ekiti State to forget their idea of seeking re-election next year, describing it as tenure elongation. Falana said Fayose’s new dream was an anomalous and amounted to tenure elongation. ‎Fayose had Monday said that he would contest the 2018 governorship election ‎so that he could serve his first term which was truncated in 2006. The governor was impeached in 2006, but the Supreme Court in 2014 nullified the impeachment that ousted him from the office about seven months to the end of his first term. Speaking on a live broadcast on Ekiti State Television in Ado-Ekiti on Monday evening, Fayose said that since the apex court had said that his impeachment in 2006 was illegal, he would then have to approach the same court to interpret what that ruling meant and also consider seeking a re-election in 2018. 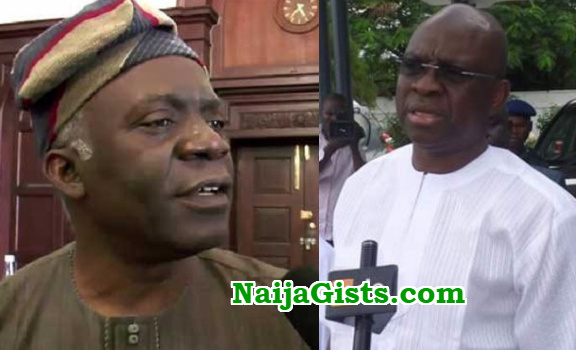 ‎But Falana said on Tuesday that Fayose’s bid to seek re-election would amount to tenure elongated which no court could grant, PUNCH reports. “Tenure extension by a governor under any disguise is anomalous. No court can prolong the tenure of a sitting governor buying the two terms prescribed by the Constitution. “In the case of Gov Rasheed Ladoja v INEC the appellant wanted an extension of his term of office to allow him to spend extra 11 months while he was fighting his impeachment from outside. “Although the Supreme Court had set aside his impeachment it was held that the relief was illegal and unconstitutional. Baba Fayoo… you don’t want to be Vice Presido again? Fayose is a good man, nothing can stop him only if he dose not want to go again. The world needs people like Fayose who help people.